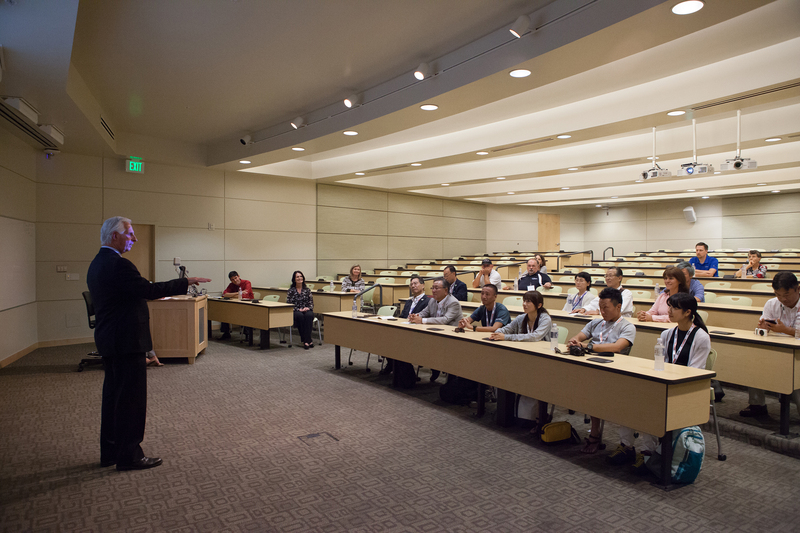 ST. GEORGE — While in town for the St. George Marathon, a delegation from St. George’s sister city, Ibigawa, Japan, got a glimpse of healthcare education in America by visiting Dixie State University’s Russell C. Taylor Health Science Center on Thursday afternoon. The 12 individuals representing Ibigawa, including four athletes who will run in the 40th annual St. George Marathon on Saturday, were greeted by Dixie State administration and toured the university’s state-of-the-art health sciences facility. Benefiting from its close proximity to Dixie Regional Medical Center and the university’s close working relationship with the hospital, the Taylor Health Science Center houses classrooms and labs where students gain active-learning opportunities to practice skills and techniques as they learn about them. During their tour of the facility, the delegation saw a variety of spaces and labs, as the center houses all of Dixie State’s Health Science programs, including Certified Nursing Assistant, Dental Hygiene, Emergency Medical Services, Health and Human Performance, Medical Laboratory Science, Medical Radiography, Nursing, Physical Therapist Assistant, Phlebotomy, Respiratory Therapy and Surgical Technology. Chizu Matsubara, chair of the Department of Education, and Matthew Morin, assistant professor of interdisciplinary arts and sciences, served as translators and demonstrated Dixie State’s commitment to global engagement. Morin presented about the university and city’s partnership in which Dixie State students travel to Ibigawa and stay with host families as part of their coursework. As part of the program, students create and update the “Dixie State University in Japan” website, which features the history, culture and attractions of the city. All website design, photos, videos and content is created by the DSU students in fulfillment of the course’s interdisciplinary research and production requirements. The two cities began their partnership in 1989, when Ibigawa started a marathon similar to St. George’s and representatives from Japan traveled to southern Utah to learn about and participate in the race. Ever since then, delegations from both cities have traveled back and forth between the two countries to compete in the marathons and share information and helpful tips about hosting their respective races. To learn about the St. George Marathon’s partnership with Ibigawa, visit the St. George Marathon online. For more information about Dixie State University’s global engagement efforts, visit the university’s website, or go to the Health Sciences page to learn about the university’s College of Health Sciences.